BC Management will be closed Thursday, November 26th and Friday, November 27th in recognition of the Thanksgiving holiday. We're incredibly thankful for the business and friends throughout the years. May your home be filled with happiness and love this holiday season. Location: Candidate may be based in any large city within Asia Pacific. Preference will be given to the following locations: Singapore and Hong Kong. The world’s largest provider of workplace solutions has a Workplace Recovery Solution Lead position focused on the delivery of improved revenue performance for our high growth Workplace Recovery business. Reporting directly into the Managing Director, the Solution Lead will serve as a product expert and industry SME in support of the Sales organization. This will include assisting with solution development for large and/or complex customers. The role will also include the development of channel partner relationships and support of these channel sales activities. The Solution Lead will also host and support industry events to establish and then improve our product image in our target marketplace. The Solution Lead will develop, support and drive Sales, marketing, and customer plans that deliver continued progressive revenue performance in their geography. The Solution Lead is expected to be an individual with a demonstrable track record of delivering outstanding business results and have an excellent commercial, communication, and influencing skills. • Drive the plan - take responsibility for devising and executing a winning plan that crisply define the target, make sure real progress is made every single month and have a pipeline of actions planned at least three months in advance. • Be precise - communicate extremely clearly in writing and verbally, create collateral, training, FAQs, presentations, white papers that are simple, complete, precise, and accessible to anyone that needs them. • Behave like a leader – drive the outcome, don’t allow others to take you off course from priorities established. To apply to this position please visit http://www.bcmanagement.com/search-jobs.html and enter the job number #2904. 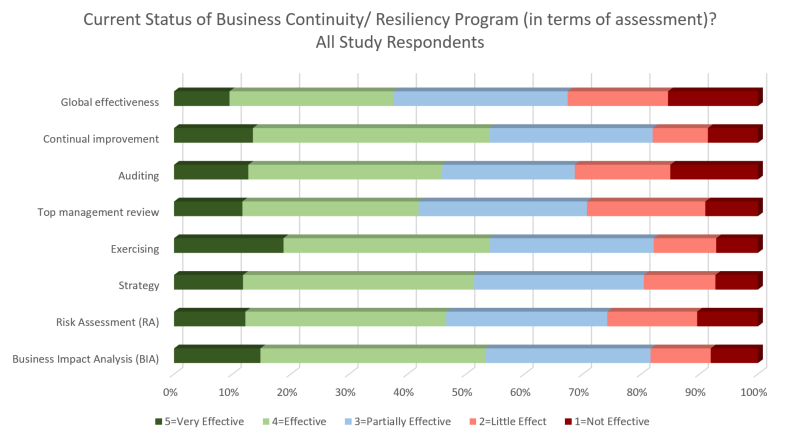 What is the Current State of Business Continuity/ Resiliency Programs in terms of Assessment? How do Organizations indicating a Program Maturity Self Rating of Very Immature and Very Mature Compare? Just 11 days left to participate in BC Management's 1st Annual Program Maturity Study - Measuring the Effectiveness of the Business Continuity/ Resiliency Program. Be sure to Participate by December 1, 2015 to Qualify to Receive a Complimentary Report of the Study Findings! The mandate of Enterprise Business Continuity Management (EBCM) is to ensure an effective enterprise Business Continuity Management (BCM) governance framework that is consistent with general regulatory requirements and industry best practices/standards is developed, maintained and adhered to across the Enterprise. Enterprise Business Continuity Management ensures that an auditable governance framework, consistent with general regulatory requirements for BCM across jurisdictions in which the Bank operates, is developed, maintained, and adhered to across the Enterprise, so that the Bank is appropriately prepared for, and can respond to unexpected disruptions to normal activities. Develop and/or revise the Enterprise BCM Corporate Standard to ensure that the Bank’s BCM governance framework is consistent with general regulatory across jurisdictions in which the Bank operates. Develop Procedural Guidelines, tools and templates for BCM to ensure the effective development, implementation and testing of BCM plans in units throughout the Bank. Procedural guidelines must be consistent with BCM industry best practices (International Business Continuity Institute) and must facilitate effective plan development and testing. Enable development of unit based Business Continuity Plans through provision of tools, training and advice to BCP Coordinators in banking groups across the Bank to help ensure that banking group plans comply with BCM Program requirements and are consistent across the Enterprise. Identify the need for, and facilitate development of new processes as required for effective implementation of the BCM Framework. Facilitate integration of BCM requirements into other Enterprise programs, such as Audit, RCA, IAAP, Scenarios, Project Management, etc. Facilitate, and chair where appropriate, senior Governance Committees in support of the BCM Framework to ensure effective implementation of the Enterprise BCM Framework. Develop, define and implement governance metrics (Key Risk Indicators and Key Performance Indicators) that are appropriate for use as multi-purpose risk metrics by various governance groups including Risk Forums in all Banking Groups and Enterprise Portfolio and Risk Management (CRM and CORM) and consistent with Enterprise strategies and external benchmarks for business continuity. Metrics must include emerging initiatives such as integrated testing and the MCPS initiative. Monitor the regulatory environment and assess the impact of new or proposed changes in external requirements in all jurisdictions in which the Bank operates. Modify the governance framework (Corporate Standard, Guidelines, etc.) to reflect new requirements where warranted, and recommend additional actions to senior executive as required to maintain cost-effective compliance with external requirements. Monitor KRIs and KPIs in significant business units (currently about 500-600 units) to ensure the integrity of the enterprise planning and testing efforts, and the consequent ability of the enterprise to withstand and/or respond appropriately to an unexpected interruption in normal business activities. Monitor, report and/or facilitate timely delivery of all commitments made to the Board of Directors with respect to business continuity. Review all audit reports that include deficiencies in business continuity, and follow up with impacted banking units to assist in resolution as required. Report progress on unit, Banking Group, and Enterprise BCM status as appropriate. Reporting must be of sufficient detail and accuracy to facilitate resolution of inadequate progress or non-compliance with Bank Policy. Prepare reports for presentation by the Deputy Group Head and COO, T&S for delivery to the Bank’s Risk Review Committee and/or Board of Directors. Reporting to occur not less than annually. Develop and manage an Employee Awareness Program to ensure that bank employees are familiar with BCM requirements, and adequately prepared and capable of responding appropriately in the event of an unexpected disruption to normal activities. Benchmark Enterprise BCM activities against external benchmarking tools to ensure that the Bank’s BCM is adequate and consistent with external industry standards and practices. Participate in external committees and forums, most notably the Canadian Interbank Business Continuity Committee, and the Emergency Management Committee and Status Group (sub-committee of the CBA) and the Interbank Contingency Planning Committee to ensure representation of the Bank in interbank activities related to BCM and to facilitate benchmarking of the Bank BCM Governance Framework against our peer group. Develop and manage the Enterprise Event Management Framework (EMF) to ensure the existence of a formal structure and the availability of appropriate information (BCM data, BCM accountabilities and authorities, contact information) and tools that are used to ensure prompt and effective handling of broad-based incidents. Facilitate regular testing of the Bank’s Event Management protocols for ERST to ensure the adequacy and integrity of documented protocols and tools. Provide training and support other Event Management teams as necessary to help ensure they update their team profile and call trees, and test their plans on a regular basis. Ensures that the group collaborates appropriately with other groups across the Enterprise in order to create and maintain a high performing team. Audit BCM plan completion by all banking groups. Coordinate work effort required for completion and maintenance of BCM enhancement initiatives. Monitor the quality of documentation and identified planning efforts. Recommend strategies for the Enterprise business continuity governance infrastructure. Recommend strategies for the T&S governance infrastructure. Coordinate with all Banking Groups/units on BCM Program updates and enhancements as part of change planning and management processes. Advise Regulators (US & Canada), Corporate Audit and Shareholders’ Auditors on the Enterprise BCM governance framework. Prescribe BCM documentation requirements to all Enterprise units. Coordinate /advise Bank officers up to and including the Banking Group Head level on items relating to business continuity. The role impacts the Enterprise and has significant influence over all Banking Groups. It is critical to achieving and maintaining effective Enterprise business continuity planning and effective responses to unanticipated interruptions of normal bank activities. In addition, this role is critical to ensure that the Enterprise program meets all general regulatory requirements for business continuity management across jurisdictions in which the bank operates. Solid understanding of Operational Risk management methodology and CSA related requirements. All aspects of the Bank’s organizational structure and critical products and services, including the delivery mechanisms and IT associated with each, and the technical and operations infrastructure. Strong strategic vision and planning ability. Excellent communication skills, especially related to documentation and reporting. Highly developed relationship management, influencing and leadership skills. Industry certification in one or more of the following: DRI International, BCI, PMI, CCSA, CISA, CA, CCSP, ISC and ITIL is a plus. To apply to this position please visit http://www.bcmanagement.com/search-jobs.html and enter the job number #2905. • A passionate, business growth enabling, accomplished innovator at finding downside IT risk to include BC/DR gaps, & developing remediation strategies that, once implemented, not only address the risk but also help turn the client’s IT into a new revenue generation enabler & market differentiator for public, private, & government operations of all sizes. • Published (including internationally), created & delivered acclaimed presentations for & to the US Federal & state governments as well as at international industry & trade conferences like AITP, ISSA, CPM, MBA, USFN, & DRJ. • Authored contingency plans, conducted SWOT assessments, & designed exercises for a plethora of diverse industry verticals & then implemented those plans successfully in the most challenging of circumstances, manmade & natural. • From account planning to sales, delivery, escalation, & follow through – as a national consulting practice managing director, currently leads virtual teams from 6 - 50 that have successfully conducted numerous BC/DR, AppSec, NetSec, SOx, PCI-DSS, GLBA, HIPAA, NERC-CIP, CJIS, DRII, SSAE16, NIST, & ISO compliance readiness assessments planning & exercises with follow on remediation work the norm. • Consistent 95%+ customer satisfaction ratings while delivering revenue growth in excess of 40% & increased the average deal size of his current startup venture by more than 10 fold in less than 3 years. 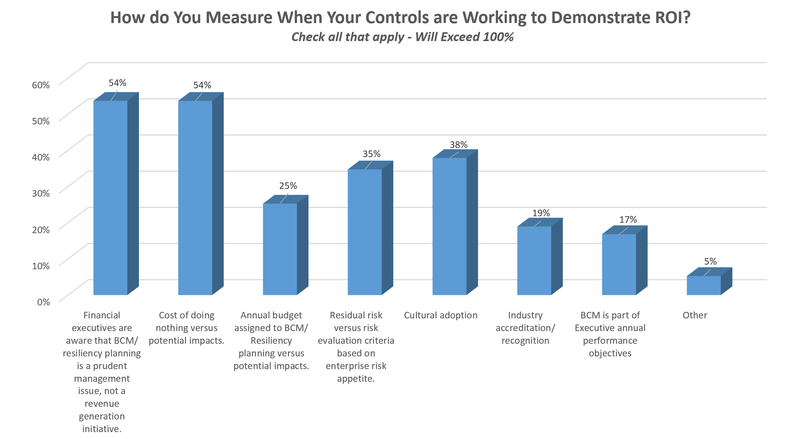 How do Organizations Measure when Controls are Working to Demonstrate ROI? 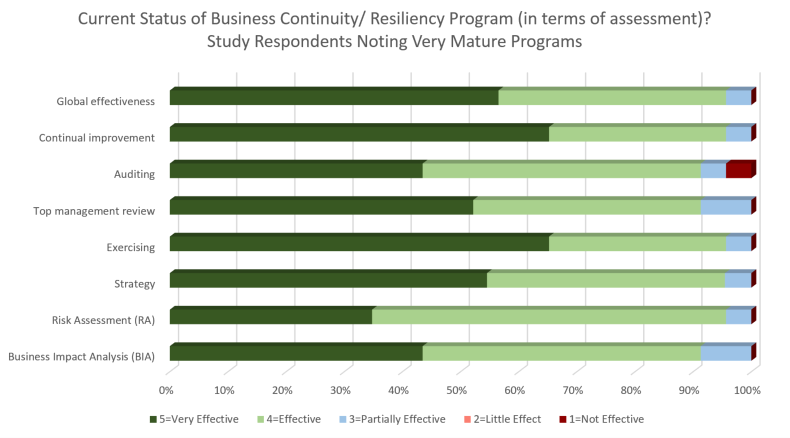 Just over two weeks left and we're already starting to assess the initial study findings from BC Management's 1st Annual Program Maturity Study - Measuring the Effectiveness of the Business Continuity/ Resiliency Program. Participate by December 1, 2015! Initial Program Maturity Study Findings - What is the Experience Level of Program Personnel and Leadership? 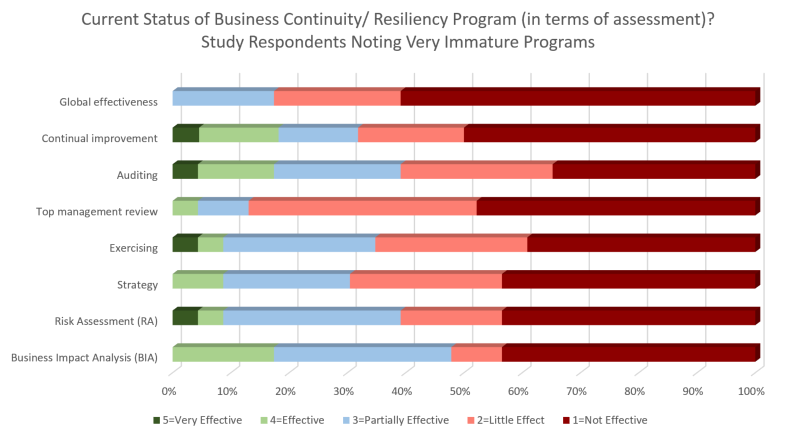 Just one week in and we're already starting to assess the initial study findings from BC Management's 1st Annual Program Maturity Study - Measuring the Effectiveness of the Business Continuity/ Resiliency Program.